This is how I used my sprouted wheat. 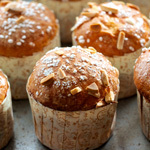 The bread is easily adapted to any taste by including your favorite dried fruits and nuts. I chose blueberries, plums, walnuts, and orange zest. 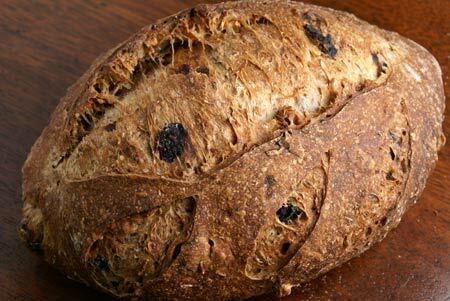 Try apricots, raisins, cherries, figs, almonds, pecans, or whatever else strikes you, or omit the fruit altogether for a more savory bread. Date molasses is available in Middle Eastern grocery markets. If you don’t have it, substitute thawed fruit juice concentrate. 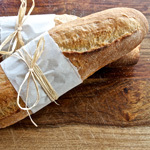 Wheat gluten can be found in the baking section of many markets, or ordered online. This submission for BreadBakingDay #11, bread with sprouts. This one-year anniversary edition is hosted this month by BBD’s founder, Zorra (1x umrühren bitte). I have loved seeing all the breads everyone comes up with each month and I’m sure this month will be no exception! Place the dried fruits in a bowl and cover them with boiling water. Soak for 10 minutes, then drain and cool for 10 minutes before starting to mix the dough. 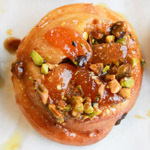 Place the sprouted wheat, sourdough starter, date molasses, orange zest, and water (hold back about 10%) in the bowl of a stand mixer fitted with a dough hook. Mix until reasonably well combined. Add the flour, gluten, yeast, and salt. Mix in low speed until all the ingredients are incorporated. Add water as needed to give the dough a medium-soft consistency. The dough will be very sticky and will not come together at this point. Continue mixing in low or medium speed until the dough comes together around the dough hook and the gluten reaches almost full development by the windowpane test. Add the nuts and soaked fruits. Mix in low speed until evenly incorporated. Divide the dough into two pieces and shape them into balls. Cover the balls with a towel and let them rest for 20 minutes. Shape the dough into batards and place them, seam side up, into a couche or linen-lined baskets that have been lightly dusted with flour. Cover or slip into a large plastic bag and proof at room temperature for about 2 hours, or until fully proofed (dough springs back slowly when pressed with a fingertip, and leaves a very slight indentation). Meanwhile, preheat the oven, with baking stone, to 450F. You will also need steam during the initial phase of baking, so prepare for this now. Before baking, make one long cut down the length of each batard, and three small ones to one side of and at an angle to the long one. Once the loaves are in the oven, reduce the temperature to 400F. Bake with steam for 8 minutes, and another 32 minutes or so without steam. The crust should be a deep brown color. Turn off the oven and leave the loaves in for another 10 minutes with the door cracked open. I was waiting to see your bread and I wasn’t disappointed. I love the way it looks and adding nuts and fruits was a great idea. Your bread looks delidious and I’m sure it tastes so too. It comes on my baking list, as soon as I get some “active” wheat grains. Blueberries? Cripes, that’s a good idea. Those slices look incredible. 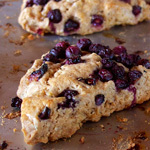 Is gluten necessary, and of course this is an awesome loaf! I’ve never baked with sprouted wheat. I’m going to have to give this a try! Thanks for sharing this great info. Wow, what a great looking loaf! Homemade is probably one of my favorite foods ever! That looks so good. Such nice oven spring even with the added ingredients and ground sprouted wheat. This looks amazing and a little daunting. I read about the sprouted wheat and it seems amazing. Zorra, do you have any idea why your grains didn’t sprout? I’ve got another batch going from wheat berries that were in the freezer and I was wondering if the freezing would do them in, but they seem to be OK. I’m sure you’ll work it out and come up with a fantastic bread! 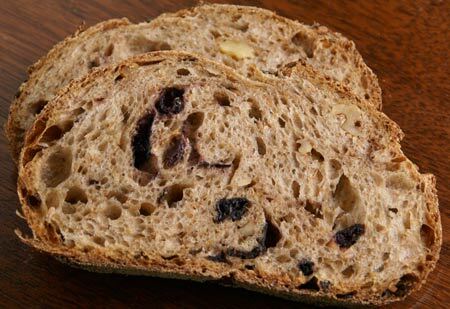 rainbowbrown, I keep a good supply of dried blueberries on hand for hot cereal, but never before used them in bread. They were rather good! Jeremy, the original SFBI recipe called for the gluten and I haven’t tried without it, but I suspect omitting it would make the bread much denser. My Sweet and Saucy, me too! maybelle’s mom, anyone who makes kimchi 400 different ways need not be daunted by this! Beautiful crumb! I like the idea of dried blueberries, must put them on the shopping list, also date syrup. Beautiful Susan and I always love dried blueberries. Blueberries always seem to add so much more that their little size would make you think! So far I’ve ruined two sproutings of wheat berries, hope my present one works. I am fixin to make this loaf, albeit sourdough and with fruit from my local Turkish market, sort of a preemptive submersion into anything Turkish that will highlight my upcoming trip! Do you have any hints for converting to sourdough, have you made it in sourdough before? brii, you are so sweet! Jeremy, I haven’t made without any baker’s yeast at all but as a starting point I’d just leave out the yeast, keep the starter at 100g, increase first fermentation time to (maybe?) 2.5 hours with two folds instead of one, and proofing time to whatever needed. Looking forward to seeing your bread with the Turkish fruits! I am drooling! So much to learn about baking, and so little time! When I first saw this post a few weeks ago, I thought it sounded most delicious and wanted to try it, but I knew I couldn’t until after July 1 (at least for this challenge). My Farmers Market sprout lady has a large variety of sprouts, so I’m looking forward to trying out different sprouts and different breads. I took my left-over wheat berry sprouts and threw them in a salad and they tasted great. Love your breads! That bread looks incredible! I still have yet to find the time to attempt a sprouted bread. I have been making a loaf of sprouted wheat bread every day for about a year and a half now. Mine has nothing in it except the sprouted wheat.